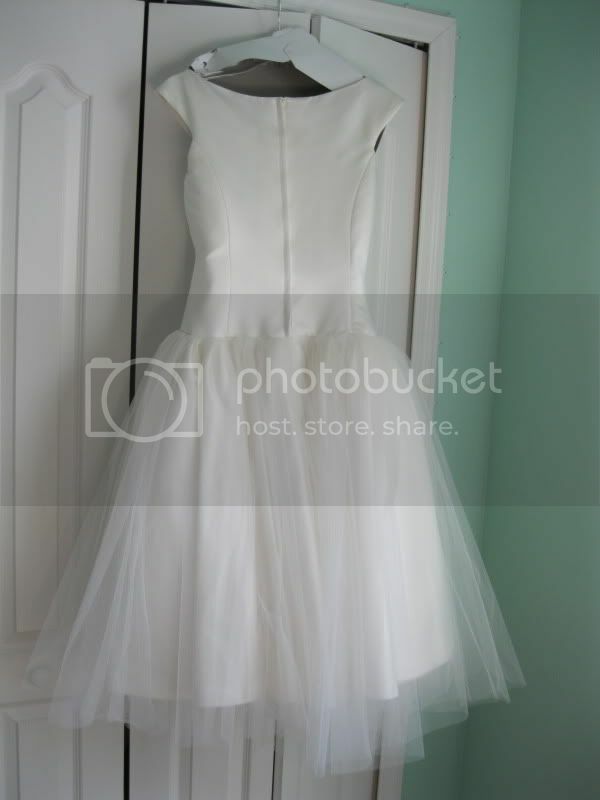 $200: tea length ivory silk wedding dress that I never wore. It is size eight. It's designed after the wedding dress Audrey Hepburn wears in Funny Face. 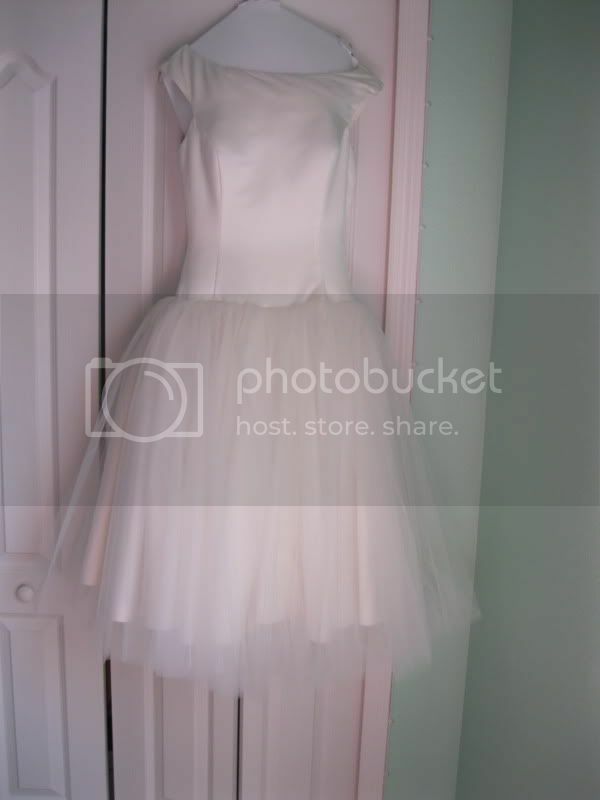 It's got a full tulle bottom that comes just below the knees and the top is bateau style ivory silk. I had planned on changing into this for the reception but did not have time and wore my ceremony dress instead so it has never been worn. Email me if you'd like more specific measurements or pictures. If you like some of the stuff in the list below, make an offer for some or all of it. Email me at acappellagirl@gmail.com to make an offer. - tall gold standing easel for holding signature frame- picture needs to be at least 15 inches wide but can be bigger and taller. Though everyone recommends her, I regret coming here. I wish I had just gotten it done at the bridal shop. To put it short, she was incredibly rude and nasty to me, argumentative, didn't want to fix things and also my dress did not fit right in length or in the chest area. The full story: The first fitting I had, I was unhappy with many things. The dress was much too long and I was stepping on it when I took one step. It was a really long argument with her to get her to shorten it. She first told me it was because I wasn't walking straight then she said it was the carpet and made me walk on tile. I kept telling her the church and venue are carpeted so it doesn't matter but it was back and forth constantly to get her to shorten it. When she did shorten it, I was still stepping all over it and tripping on it. I was really stressed out about it and we ended up pinning and taping the dress up at the bottom layer so that I could relax. The chest area never fit me right. She told me she couldn't alter it all because it would mess up the dress so she added in cups instead that made me look huge. The dress still poked out and I felt was too revealing because it did not lie flat. She said fashion tape would fix this but it did not. It bothered me so much that I don't like any pictures that are from the side because you can see in the dress. Judy made me feel incredibly unhappy and insecure in my dress after my first fitting. She said I would never be able to dance in the dress and that I wouldn't be able to eat on my wedding day. She said I couldn't raise my arms or lean back. She told me the dress was too revealing for a church ceremony but then refused to fix the chest area when I kept arguing that it didn't fit me and people could see in. It was a really long argument for her to shorten the straps so it was at least a little better. She actually made me hate my dress and I felt terrible in it because nothing fit. After the fitting I cried and I was soo stressed out about not being able to dance that I spent 200 dollars on a reception dress that I never even wore. I asked her to fix the chest and length of the dress and to add a belt to make the waist tighter. Each of these fixes was a really long argument where I had to push and push to get what I wanted. I'm not a mean person and it was really difficult for me to be this aggressive but I really needed it to fit. I actually really hated the way the bustle looked but I was soo tired of arguing with her that I gave up and didn't even say anything about this. When I went for the second fitting, I just paid her and left because I never ever wanted to see her again. Seeing her caused me way too much anxiety for it to be worth it. I ended up taking the dress to a second seamstress and paying again to have the bustle fixed the way I wanted it. To Judy's credit: the second seamstress also didn't want to shorten my dress or fix the chest area so that it would fit. She also complimented Judy's bustle work. So, maybe Judy does good work but she doesn't listen to what you say, want to fix anything or care whether or not you are happy. I I would've happily paid twice the price or more if they had just made the dress fit me well but I think they didn't want to take the time and effort to do all that work because it was a difficult dress to alter. Positives: Candi showed up early and with an assistant. I loved the way my hair looked. It was exactly how I wanted it and it lasted all day for twelve hours and never wilted or fell at all. It looked great in all the pictures. Negatives: We discussed the schedule of who gets done when on the phone the week before the wedding. I had planned to eat at 10 after my make up and then get my hair done at 10:30 to 11:30. The morning of the wedding, she wanted the make up artist to change her schedule around and do everything differently so she could leave at 11. I told her that wasn't the plan and we needed to stick to the schedule. She said it didn't matter, she was leaving at 11. I got really upset and told her I needed to eat now and the limo wasn't coming until 12:45. She told me That's too bad, it's in your contract. So I went and got the contract which said that she would stay till 12:45. This didn't phase her at all and she said "I'm leaving at 11". At this point I was really nervous and I went to go scarf my food down super duper fast and I actually was shaking so much that the plate of food went in the air everywhere. Everyone came to help me at this point and Meghann (the make up artist) went out into the garage to speak to Candi. I don't know what she said but they came back in and said to finish my food and not to rush or stress. So, I did. Candi did my hair then and she took her time and did a good job and ended up leaving at 11:30. I know she had another wedding to go to but I don't know why she scheduled them so close together. Meghann also had another wedding but she did not try to rush us or leave by a certain time. Meghann did a phenomenal job on my make up. She put it on at 9 AM and it lasted all day for over 12 hours. I did not have one single chance the entire day to look in a mirror or to touch up my make up. We also spent 45 minutes in traffic and a lot of time taking formal pictures outside at 4:30PM before the reception. The make up was still on even then. It photographed very well and looked very natural which is what I wanted. My skin looked beautiful and flawless and the photographer commented on how great the make up was. But Meghann did so much more than that. She brought her own table which was so convenient because I had to buy a card table so that Candi had a place to do the hair and everyone else could eat at the regular table. It was nice that Meghann brought everything she needed and didn't expect me to get something for her. When Candi gave me a difficult time about the schedule, Meghann really calmed me down, she talked to Candi and she was just a positive person to have around on my wedding day. She felt more like a friend than a wedding vendor. She also packed up all of the food from our catered breakfast for me and helped out with other little things. All the girls loved her and she was just a really great person to start the day with. I'm so glad I hired her. The Portofino Bay made me feel like a VIP celebrity every single time I visited. I know my wedding was probably one of the cheaper ones they've ever don but even so, I never felt like they treated me unimportantly. I got free valet every time I came and they offered me free wine in their bar a few times as well. They always paid attention to my questions, got back to me quickly and were very detail oriented. In the invoice that included everything, Bonnie listed all the details I told her about including which kind of tables would make up the head table, signature drink recipe, info about everything I was bringing and what they would set up for me, cake design and flavors on the banquet manager form. I didn't need to remind her of anything. They were able to accomodate the requests that we made about room changes as well. On the day of the wedding, everything went very smoothly. The food was amazing and everyone loved it. The presentation and quality of the dishes is phenomenal. They add a lot of special little touches like large decorative plates, etc. There were only two things they made a mistake on. 1. They did not put the bar where I asked them to put it (next to the dance floor) even after I rearranged where all the tables and the cake table went just for this to happen. This didn't matter though because it turns out my family barely drinks. 2. They didn't put any raspberries in the chocolate cake like I had asked for and put on all of the menus and signs. This upset me too but the cake was still delicious. It was on the banquet manager form so it must've been the cake baker's oversight. They also didn't decorate the top two tiers as we had discussed, only the bottom layer. I still liked how the cake looked and tasted though. However, the Portofino Bay went out of their way to make our wedding night special. They surprised us by putting rose petals every where in our room and making a heart on the bed. They also left us two large plates of tuxedo strawberries and a chocolate gondola filled with fresh berries and decorative chocolate. They left us three bottles of Champagne and a bottle of bubble bath in the tub, candles, a handwritten thank you note and a CD of Italian Opera music. Also, we were so full that we could barely finish our meals. We asked to take them home and they said we couldn't because of health code restrictions for hotels. Instead, they made us brand new fresh meals and brought them up to our hotel room with a really nice table set up with a flower in a vase right before we got to our room at the end of the night. The picture opportunities at the Portofino Bay are incredible and we were able to get the most amazing pictures. The ballroom was also stunning. Our guests were able to get into Harry Potter exclusively on Sun. morning when they stayed in the hotel and they got their rooms for over fifty percent off the normal price. Our guests also got onto all of the rides at Universal without waiting when they stayed in the hotel. Almost all of them made our wedding a family vacation and stayed to visit the parks. Ashlie answered my questions during the planning process and suggested us vendors to use. She got us a fabulous deal on the linens we used and the price could not be beat. She met with me a month before the wedding to go over all of the details of the day and contacted all of the vendors with a schedule a week before the wedding. The day of the wedding, she made sure everything was in place at the venue and met me entering the church. When we were taking our pictures in the outside July heat, my husband's boutonniere wilted quickly. We called Ashlie and in less than five minutes, she brought another boutonniere for him that looked perfect. That amazed me. Before the reception, she brought us into the room alone and it looked perfect. She added some decorative candles of her own and did the decor on the head table for us and it looked great. After the reception, she made sure I had everything I had brought with me and that it was delivered to the room. Her personality was also very friendly and she was a good person to have around on your wedding day. The limo showed up on time and was clean and air conditioned. What impressed me was that I had given the garage door opener to my father but then he left before us with the garage door open and I didn't think of it! Glenn, our limo driver, pressed the garage door button and then ran fast and jumped over the sensor and under the closing door to close the door for us. He had to try several times but he finally got it. I was very relieved that it would not be open our entire honeymoon. One thing that did bother me is that there was a ton of traffic on the way to the reception. I really wish he had taken side roads or checked the traffic report because the other vendors got there way before us and left after us because they took shortcuts. We spent a long time in traffic. When we got there, I was rushed and didn't ask him for my emergency bag in the limo's trunk. He drove off but luckily my maid of honor had the sheet I gave her with every vendor's phone number. She called and he came back and gave it to her very quickly. I loved my flowers and they didn't break the budget at all. Debbie worked with me to not only meet my budget but she came in under it and she had the best ideas for really amazing flowers out of all the florists I visited. All of our personal flowers were beautiful and how I wanted them to be. We had two different centerpieces and those were both fabulous as well. They made our wedding look and feel like a platinum wedding without the platinum cost. Jay had us come into the room before everyone else did to see it and he played our first dance for us by ourselves. It was a wonderful moment. He also made sure to check up on us during dinner. He played every single song on my request list and really followed our play list well. People were dancing the whole night and he didn't talk much or make a spectacle of himself like some wedding djs like to do. He is classy and let's you and your groom be the stars. They were phenomenal. They made the wedding ceremony so beautiful and perfect. I arranged some pieces for them and picked out a bunch of others and gave them to them six months in advance. They are very very good. They have wonderful blend and a very classical tone but they were still able to sing the secular music I gave them as well. The pieces I gave them were incredibly challenging with very difficult parts that had wide ranges, 8 part harmony and difficult leaps. But, they sang them all beautifully. The music director also played the organ and he did a nice job of improvising with some organ music when we needed more time. They also sang all of the mass parts in four part harmony which was lovely so if you are Catholic (or even if you aren't) I highly recommend them because they understand the order of the mass very well. My photos were stunning and I felt I got a very good value. Derek was with us for 12 hours taking pictures. He was very professional. Our photos came out stunningly and there are so many that I love. What impressed me the most though was his speed and knowledge in getting all the photos. There was a ton of traffic on the way to the reception but Derek took all the back roads to avoid traffic and was able to park his car, set up his equipment and be waiting for us when the limo pulled up even though he left after us. I was worried because our picture time had been cut short by almost forty minutes because of the traffic. However, he was incredibly fast. He knew all the spots and we went to them quickly. He directed the wedding party well and was polite but good at telling us where to go. I gave him a two page shot list and he got every picture on my shot list in 45 minutes and we went to 9 different locations to take pictures in that time. He was incredibly quick but very accurate with his photos. He didn't need a lot of time to compose a great shot. I think that this was his best quality. You really need someone who can do a good job without wasting any time and who knows the venue locations really well beforehand. The only thing I was disappointed in was that I wanted nice formal photos on the staircase with the bridal party which we got except that he didn't line us up, we just gathered and you can't see my husband's brother well at all. I would've really liked to be posed better. Though I wish these photos had come out better, I wonder if it was partly my fault because I was really worried about the time and being late and he was trying to get me to the reception by the time I had asked and those were some of the last photos we took. I got all 1100 of my pictures online three days after the wedding and I got a CD with all of the pictures on it 10 days after the wedding. We chose which ones we wanted special editing done to and he fulfilled all of our editing requests. I love all of the photos so much that I had to get several on canvas to hang up just because I could not choose. Our wedding photos look like artwork or something that belongs in a magazine and I think that is thanks to Derek's artistry. He also did a great job designing our album. I am a very picky person and I had a very specific idea of exactly how I wanted our album to look. Derek was great in giving me tons of updates in the album design and redoing things to be exactly how I wanted them. He even went out to the Portofino and took a special picture just to add it into the background of our album. Our album is gorgeous and I look at it a lot. He was very pleasant and cordial and easy to work with and professional. Overall, I'm really happy we chose Sunshine PHotographics. They did an excellent job. Haven't seen any videos yet so I'm waiting on that. However, he did a great job beating the limo to the reception from the church and being set up with his camera to film me getting out. He and the photographer worked really well together all day and they were very coordinated with what they did. More when I get to see the videos. Brass Pin Linens gave me the absolutely cheapest quote out of every linen company. They were very friendly and had good customer service. They had a good selection of colors and fabrics. We ordered chair covers, satin sashes and table runners and it was very budget friendly. The linens were clean and not wrinkled, the material was good, everything was set up on time. There were no problems. I'm not going to rate them because they're a church. I'll just tell you about them. Leading up to the wedding, they were one of the strictest churches in all of Orlando. They have a million rules and it was difficult to work with their music director to get permission to have a choir. He never ever responded to any emails or phone calls but he had to approve everything I chose so that made it difficult. I always had to find him at Mass and then he'd be friendly enough and approve my choices. I had to get special cap sleeves on my dress and a shawl for my girls because you can't have any bare shoulders. On the day of the wedding though, they were very nice. They have a nice side room where you can wait with a bathroom and you can peek though the blinds into the church to see everyone. They were very good at handling some issues with guests with me never knowing and making sure everything ran smoothly at the rehearsal and the wedding. They also surprised me with a high quality CD recording of the mass through their church's mics and sound system which was possibly the best gift ever as I spent a ton of time and money on the music. Wedding shoes: Endless.com – A . They delivered them so fast! They were there the next day and they have an amazing return policy where you can return things without paying shipping cots. I love my shoes. It was really hard to find shoes that had a kitten heel with a quarter inch height but I found exactly what I wanted and am very happy with them. 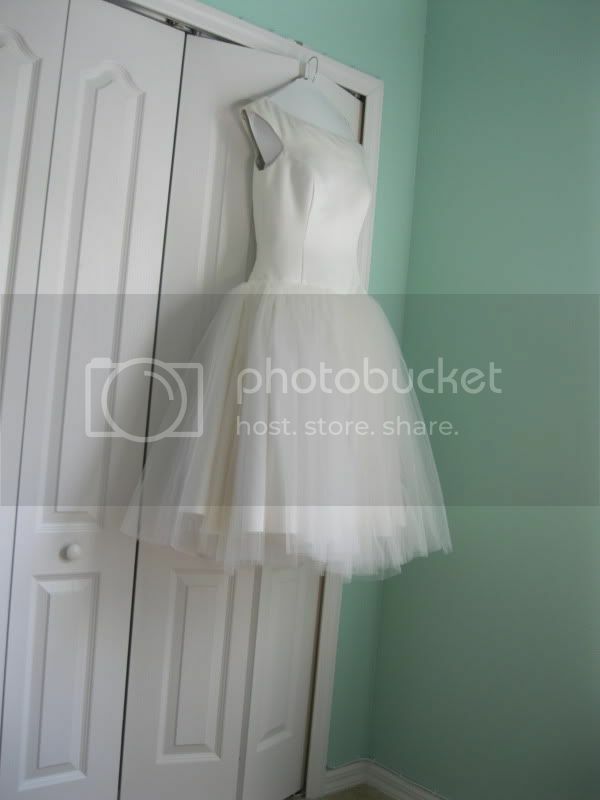 Bride's Dress: Demetrios – A The dresses here are fabulous and I didn't find more beautiful dresses anywhere else. The first saleslady I had was super pushy and I didn't like her. But since then, I went back at least five or six times and never had anyone pushy and never saw her again. I went to try on dresses there three times at least before I chose one and they were very nice about it. After I got it, it came in way before they said it would. They let me come back later on to try on a crinoline because i forgot to buy one. They lent me a sample headpiece for free for a week when I went to do my hair trial because my order wasn't in yet. They've always been nice and I haven't had any problems. They had the best selection of dresses. I thought the dresses were high quality. We received good service. The dresses came in early and in the right size. Their service was very good. They got all of the orders correct and in the right size. The main manager was very helpful. We love our rings. They were very affordable and we got a good deal. We also got the ring service plan and I've gotten fitted beads added to mine and had it redipped for free several times. They are always polite and helpful. I got a very nice magnet save the date in the colors I wanted with our picture on it and all the necessary info. I really liked the selection they had and there were no problems with this vendor. Designed my own pocketfold invites. If I had to do it again, I would never have spent the time on designing my own invites. However, cards and pockets made it less awful for me than it could’ve been. I had a really really hard time converting to PDF without losing image quality and I had to try a million different programs before I finally gave up and redesigned my invites with adobe photoshop so I wouldn’t have to convert them. After my first proof came back terrible, cards and pockets worked with me to make sure I wouldn’t have to order a ton more proofs. I’m not a graphic designer and couldn’t tell that the pdfs I was sending them weren’t high resolution or that the color was different. I must’ve made at least ten different drafts that I sent them. Instead of paying for ten proofs, with each draft they wrote me back and told me what I needed to change to make the color match or to make the resolution higher so that the prints would come out right. They always wrote me back in a very timely manner with details about exactly why my next draft wouldn’t come out right. When I finally sent them a draft that they thought would come out really well, they were pretty quick to send me a final quote so that I could move forward with my order. It took so long that I was afraid I wouldn’t’ get them in time but I did and I had enough time to assemble them. I was glad I didn’t have to pay for and wait for ten different proofs for all of my mistakes. They also ran out of a pocketfold I wanted the same day I ordered it so they gave me the more expensive one for the clearance price. I got lavender pocketfolds and they printed and cut invitations, plus three inserts plus a monogram on the front and backing mats. I simply glued them together. I also got lavender cardstock from them for menus and cream cardstock for table numbers. The price was good and their service is absolutely wonderful. I’m really happy with how my invites turned out. www.etsy.com/shop/DazzleMeElegant - A I ordered a monogram crystal cake topper from here. I got to choose the font and letters, and the color of crystals and material of the backing. I chose Swarovski crystals and she sent me several proofs with different fonts so I could see how it looked. I’m really happy with the cake topper. It looks just like I wanted and cost about fifty dollars less than if I had gotten one from a wedding website. www.etsy.com/shop/curtisscreations - A - Her prices are phenomenal. I made a special request for Victoria’s Secret Body by Victoria seamless underwear in blue with my new married name in crystal rhinestones on it. The underwear I want costs 11 dollars by itself and I don’t know how much the crystals cost but she couldn’t have made that much because she only charged me twenty bucks. Way cheaper than other places. In addition, she wrote me a very nice personalized hand written thank you card with the package. It was a nice touch. I love the underwear. It looks great and it was fun to wear. They sell veils and tiaras and other small wedding accessories. Their veils are much lower priced than the veils at a bridal store and they do have a fairly good selection. I really like the veil I got and paid half what I would've paid for it at the bridal store. So, in this respect, this is a great store. However, the woman who owns this store is very irritating to deal with. I think she tries to be helpful but she has SUCH strong opinions and forces them on you soo much that you can't even think. It's like shopping with an incredibly overbearing mother. I took a really long time to decide because I was waiting for her to stop making suggestions and giving her opinion so I could just think about what I wanted. When I brought a couple veils out to put next to my dress which was in my trunk, she came with, held the first veil up and then said Oh this is the one. It's perfect and I grabbed for the other veil to compare and she held it away from me and wouldn't let me compare. She took it back in. When I was looking for headpieces, all she had was larger ones that look like tiaras and I wanted a small one. She kept going on and on about how since I have a poofy dress that there is no choice but to get a large tiara. When I told her I didn't want to look that princessy, she said well you already made that decision by getting a poofy dress, didn't you? She wouldn't stop talking about how a smaller headpiece would look like nothing with my poofy dress and it would be terrible. I got my headpiece at another bridal store where they don't bother you. So, to summarize, if you want a good deal on accessories, come here but only if you are strong willed and willing to tell this woman to be quiet and let you decide on your own. You also really have to stick up for what you want. It's like a battle of wills. If you are unsure or easily swayed by other people's opinions, I would suggest never coming here. It's better to figure out what YOU want and pay more at another store. We stayed a week in an Oceanview Honeymoon One Bedroom Villa with Butler Service. Honestly, because of how bad the butlers were, we would never ever go to a Sandals resort again. However, we both agreed that had we stayed in the main Riviera building and not had any butlers that we probably would've enjoyed the trip much more. Although Sandals still doesn't count as luxury to me. Butler Service: Having a butler is like hiring an apathetic moron to do things for you that you could easily do yourself. Every single day of our trip, the butlers did something that messed it up a little bit. We had two butlers. Our main butler was the MANAGER of all of the butlers and he did the worst job. The second butler had only worked there two months but he wasn't much better. - I'll start with the worst: They lied to us. At the beginning of our trip, we told the butler all the restaurants we wanted to eat at ending with the very elegant and formal restaurant on the last night because the butlers make "reservations" for you. We knew that each restaurant was only open certain days and there was a schedule posted in the lobby. But, we trusted that the butlers would know this schedule and inform us about any nights the restaurants weren't open. Well, one night, the butler told us that a restaurant had unexpected maintenance that night and we'd have to choose somewhere else. We weren't overly concerned until the last night when our butler TEXTED us with bad spelling saying the exact same thing about the restaurant we had looked forward to dining at the whole week. At that point, I went to check out the schedule in the lobby and saw that it was never open on that day! Had I not had a butler, I would've simply checked this information out myself and planned accordingly, but I stupidly thought that a butler would bother to check a posted schedule for me. So, we never got our fancy dinner that we were really looking forward to. - Our butler called us at SEVEN AM the next day to tell us he had our "special" menu and that he was coming over immediately to get our orders. I told him he woke us up and not to come. He insisted that he was coming and hung up. I called him back and said again that we were sleeping and not to come. He said he absolutely had to get our orders in right away so that we could have breakfast by 10:00 like we had asked and that he would read the menu to me. It was the exact same room service menu that we ordered breakfast from every day with one new item: blueberry pancakes. So, we ordered those. We tried to fall back asleep but couldn't and didn't get very much sleep at all. Then, instead of coming at 10:00, our breakfast came at 11. So, we ordered really early for no reason. Also, the pancakes sucked and were plain with no blueberries and everything that we normally ordered from the room service menu was way better. - We ordered room service breakfast every morning and when we ordered it through the butler, it took an hour. When we decided to bypass the butler and call room service, it took half an hour. We bypassed the butler because he only delivered it to us personally and set it up for us on the first day. After that, it took forever and he didn't bother to bring it and set it up for us so we stopped bothering to call him. - They give you a cell phone that you use to call your butler any time you need something but they don't bother to give you a charger. Twice on our week long trip, our phone died. The first time, we asked for a charger and waited around in our room for over an hour till the butler finally showed up. But, he didn't give us a charger, just a new battery. The second time, it died and I had to use the room phone to call the front desk. They didn't answer the phone at all for twenty minutes. Then when someone answered, they didn't know the butler's number. Then when I finally got through to the butler, he didn't answer his phone and I had to leave a message. When I finally called again and got through, I again said I wanted a charger but he took an hour and brought another battery instead. So, we wasted over an hour of our time twiddling our thumbs in our room waiting for the butler. - We had two separate reservation numbers for the exact same room. One half of the trip we paid for and the other we won at a bridal show. Our butler knew this. However, he neglected to inform the front desk or anyone at all. So, three days into our honeymoon, someone came banging at our door at seven AM (so, this is two days now that we got woken up early) and they wouldn't stop. So, my husband gets up and the guy says he's here to take our bags and my husband informs him that we are not checking out, we have another reservation number. Then, we call the front desk and inform them. They say that they are aware of it. At 7:30, a bus driver comes banging on our door telling us we have to check out and we say the same thing. At eight AM, a housekeeper starts banging on the door and we tell her the same thing. In there, someone else from guest services calls us to remind us to check out too. This whole time, our do not disturb sign is on the door but is ignored. Why didn't anyone (ahem, the butler) inform all these well meaning people that we were not leaving? - Sandals advertises that the butlers will get you "your heart's desire" to make your vacation memorable. This is BS. Their service was terrible. ONE time, it was raining really really badly and I called the butler and asked him to please bring us an umbrella. He said he couldn't because he couldn't go out in the rain. So, we and our stuff got soaked because he couldn't come out to bring us an umbrella. That's some high end service. This was the only out of the ordinary thing I asked him to do the whole trip. Also, our butler constantly sent other butlers to do his job for him so we rarely saw him. - We had made prior reservations for an excursion which we told the butler about on Monday. When we went to it, they didn't have our name and there was a big confusion to go through. It was sorted out eventually because I brought the invoice with but it would've been nice if our butler had confirmed our excursions with the front desk beforehand and sorted that out for us since he knew about it well in advance. What did the butler do right? One night, he came to our room before we came back from an excursion and drew a nice bubble bath for us. We liked that. It is the only thing he did right our whole trip. The only way to get a "reservation" at a restaurant is to have a butler. Even so, you still don't get a reservation, they just tell you you do. Really, your butler gets you there and then you wait at the bar for up to half an hour and you get the first available seat and cut in front of the line. They also always give you the best seat with the best oceanview which is really very nice. Some people wait up to two hours for the nicer restaurants. This is the only advantage to having a butler. - Most of the rooms are located in the Ciboney Villas area and are far up the mountain and away from the main resort. YOur butler drives you to your room in a golf cart. They are always very prompt to pick you up which is nice. However, it would be so much more convenient to stay in the main Riviera resort because you're closer to all of the restaurants and events and then you don't rely on your butler for transportation. If you don't have a butler and you're staying in a villa, you have to take this little jitney to your room. You can wait forever because there are tons of people and they only hold six and then you wait for all of those people to be dropped off. It's a pain and inconvenient. For the price, Sandals was very good. But, it is in no way a luxury resort. However, it is far cheaper than many five star hotels I've stayed in so I think you get what you pay for. I was fooled into believing Sandals would be as nice as the luxury resorts I've stayed in because they advertise an expensive price and then tell you you're getting 65% off. However, I was engaged for a year and a half and that sale never ever went away. So, the sale price is the actual price. I wish I had known because I think I would've preferred to stay at a real luxury resort instead of paying less and getting crappy service. Why isn't it a luxury resort? - Nothing is air conditioned except your room. All of the restaurants are outside and the lobbies are not air conditioned. I was fine but my husband felt like he was having heat stroke all the time. - It's not up to US safety standards. The pool area was covered with tile that was incredibly slippery and always wet and always full of really drunk people. What a terrible combination. Nothing was anti slip. Also, nothing is handicapped accessible. Every room, lobby, outside area and restaurant has at least three steps leading to it. Don't come here if you are handicapped. - They constantly try to sell you crap. We felt harassed. We went to a "welcome hour" on the first night and people actually followed us around to get us to sample hot sauce when we said we didn't want any. Then they practically forced it to us. They followed us around to ask us about spa treatments, excursions, etc. They don't leave you alone. When I was sleeping at the pool, a lady woke me up to try to sell me spa treatments. Also, we got a couple's massage and right after our wonderful massage when I was trying to feel totally relaxed, the lady came into the room and gave us a hard sell for some cosmetic skin care products for five or ten minutes and we kept having to say no. Then they put it on our massage bill and we had to tell them to take it off. - They call your room whenever they feel like it and ignore the do not disturb sign. I've never been to any hotel ever where the front desk called me to bother me. Every hotel has always left a message on the phone from the front desk to tell me something. They called us at really early hours to ask us questions about afternoon excursions. - They had parties that should've been fun but just weren't because people just didn't seem to be into them. There was a chocolate party with a band and good food that should've been great. But, they had it in a tent with bright florescent lighting everywhere and no decorations. It was really bright and I think because of that, no one danced at all. Everyone just sat and ate their chocolate and quietly listened to the band. It made the party really lame. ONe other thing to note: Every single person that we met at Sandals was on their honeymoon. All of them. No one cares that it's your honeymoon because they are all honeymooners. You go from being the special bride and groom to being totally unimportant and getting crappy service. It's a let down. So, what was good about Sandals? The alcohol was the best part. We never ever waited for a drink. The bartenders were always happy, knowledgeable and fast. They were the best service at the resort. There is a wide variety of alcoholic drinks and some really really good ones. They pour strong and are not cheap with their liquor. There were bars everywhere, even inside the pool and a constant flow of gratuity free alcohol. The service and selection was better than at an American bar where you pay and tip. The food was good. Every night we ate in a different restaurant with a beautiful ocean view. I had a four course meal with steak every night and tried many different appetizers and deserts and salads, etc. Though there were some hits and misses, I was very pleased with the food overall. Our room was beautiful. It was very nicely done with a nice balcony overlooking the ocean in the distance. Everything in our room was high end and tropical. We also had a jacuzzi tub but that broke and then had to be fixed three times so I wouldn't count it. Our shower was large,. beautiful and very high end. We had our little pool that we shared with a few other rooms. The pool area and beach area were very nice. It was so serene and relaxing to be at the pool because it is adults only so it was so quiet and the pool is large and has lots of lounging areas. The free glass bottom boat ride and snorkeling were also very nice. We stayed here the first two nights of our honeymoon. We paid the same price per night for the Portofino that we did for Sandals (though it did not include all the unlimited food and drink). The Portofino is a true luxury resort. I have stayed in many luxury resorts like The Plaza and the Del Coronado and most of the Disney resorts. The Portofino by far is the best one I've ever stayed at. Our room was very beautiful and overlooked the piazza. We had an enormous bathroom with a jacuzzi tub and everything was high end. The service at the hotel was excellent. We had a club level room and we got to have breakfast in the concierge lounge in the morning, snacks all day and then very high end hot hors d'oeuvres in the evening along with free wine for an hour. The pools were gorgeous and fit the theme very well. The whole hotel was just so impressive and elegant. In the afternoon, we walked over to the theme parks and got on all the rides without waiting because we were hotel guests. In the evening, we had appetizers and wine on the balcony of Bice and watched the free performance of the Opera singers over the piazza. I felt like we were in Italy. It was incredibly romantic. - When I think about what you get for the price at the Portofino vs. Sandals, I feel like Sandals is a budget resort. Though you pay the same price, all the food, etc at the Portofino is incredibly expensive and at Sandals, it is free. So, for what we paid, we got a pretty good deal at Sandals. I only wish that good service came with it.